Workers at the Galway munitions factory in 1917. A LECTURE on the Galway women who built bombs for the British Army in WWI in the Galway munitions factory, and a film screening on the life nad work of Michael Davitt, will both take place in the Galway City Museum. On February 12 1917, the Galway munitions factory produced its first shell which was inscribed and presented to local businessman Máirtín ‘Mór’ McDonogh, a key figure in ensuring that the factory came to Galway. This shell is currently on display in Galway City Museum as part of its Galway and the Great War exhibition. 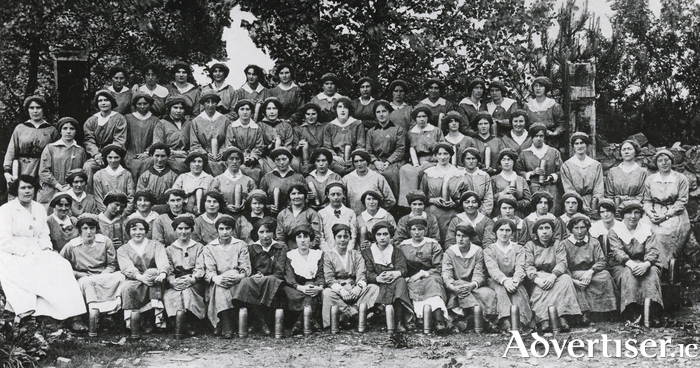 Though the factory was short-lived, it gave employment to 115 people, the majority of whom were female, working three, eight-hour, round the clock, shifts. Historian and author Jackie Uí Chionna, who recently published He was Galway: Máirtín Mór McDonogh, 1860–1934, will discuss Máirtín Mór in the context of the Great War and Easter Rising, and his role in the establishment of the Galway munitions factory this Saturday at 2.30pm. Singer and musician Dónal Maguire will present his documentary, Chasing Michael Davitt, examining the life of the 19th century Irish politician, agrarian agitator, founder of the Irish National Land League, and Home Rule advocate, on Saturday February 18 at 2.30pm. Davitt was one of the early patrons of the GAA and officially opened the Glasgow Celtic Association Football ground in Scotland. Admission to both talks is free but space is limited so booking is advised through the contact Galway City Museum (091 - 532460 or [email protected] ).